The Institut des Relations Culturelles et Politiques was formed in 2017 in Bamako, Mali with the aim to foster public discourse and disseminate knowledge to young people about various actual issues of political, economic, cultural and international relations. The organisation emphasises the protection of human rights and the preservation of cultural diversity. The founders of IRCP Mali believe that peace and stability in the international environment can only be achieved if we respect those values. It is always highly inspiring to meet with people, who want to give something highly beneficial to their local environment. In this case, starting a new organisation. What was the first, most inspiring motivation to establish the institution? The first and most inspiring motivation to establish IRCP in Mali happened during my internship in Hungary at the Institute for Cultural Relations Policy (ICRP Budapest). We always ask questions from ourselves about our vocation after university and how to utilise the things we learned during the years spent at university. In fact, vocation is the quest of the big love – we hear about it most of the time, but we do not really know how to look for it. I found my ideal – my vocation – when I met the founders of ICRP Budapest and the people working for the institution. One of the aims of the Hungarian organisation is to help young people to find their vocation and to coach them. Throughout non-formal educational activities, it provides knowledge, experience and entertainment. The programmes organised by the institute are increasing citizenship awareness and patriotism. So, after being in touch with them and participating in so many incredible activities, I talked to the director and told him that I would like to establish this institution in Mali: my country needs it and I will be happy to share this experience with my fellow citizens. What are the aims and main goals of the institution? The aim of IRCP Mali is based on the protection of human rights and the preservation of cultural diversity throughout dialogue. To achieve this aim, the institute organises different events, such as conferences, seminars, forums and workshops. Throughout these programmes, young people are able to develop some abilities which can help them as well as the country to move on and to solve some of the difficulties and challenges. The main goals of the institution are facilitating academic education in the field of diplomatic and cultural relations, encouraging public debate, emphasising the importance of conversation and the relationship of different cultures. What are the aims and main goals for you, as the founder, personally? As a young International Relations student, aspiring a career in this field is an ambition I am looking forward to achieve, I have a special interest in foreign policy, cultural diversity as well as negotiations and mediations in the global political arena. This association that I set up, will prepare me with hands-on experience in this field. It will be an opportunity for me to get in touch and cooperate with other think-tanks and reputable intelligentsia. Such accumulation will enable me to implement in my country what I gained and will wise me up with broader perspective in dealing with various phenomena in international relations. In addition – as an African – a chance for being a part of this initiative will pave a way for me to acquire skills and also bring out the innate talent in me which I intend to use in order to develop my continent and Mali and – to be more precise – for the development of my country and the continent at large. In addition, helping my fellow citizens to acquire skills, knowledge, to bring out the innate talent they had and finally to find out their vocations. What are the prospects of this new institution? In line with the vision of our partner institutes, we believe that cultural relations policy will be a key factor in international relations in the 21st century. Dialogue of civilizations and cultural diplomacy can serve as new tools in intercultural relations. As the role of sub-national regions emerging, identity politics become more relevant. The IRCP Mali is aware that identity preservation is an aim and instrument at the same time. We believe it serves international peace and stability in the future. Cultural relations policy takes sub-national entities into account therefore it contributes to support peaceful patterns of international relations. The conception of cultural relations policy has a unique approach towards subjects of international relations for the reason that its scope contains not only states but sub-national entities and institutions in international relations as well; however applied methodology of this approach recognises existing differences between entities with various level of sovereignty. Does the institution have local partners? What is the main target group of the institution? The IRCP Mali has local universities and centres among its partners (INFTS, UCAO and Centre Luc SANGARE) at the moment, even though we have started to organise events here just recently. The institution is mostly focusing on young people as target group. As a future responsible of the country, the youth has to be more focused on political affairs, cultural and international relations issues. Currently what topics are the institution focusing on? Actually, we are focusing on different fields and the mostly social science topics include human rights, culture, economy, international relations, politics, education, society and security. What were the biggest challenges of establishing the IRCP in Mali? The biggest challenge of establishing IRCP Mali was the administration process. It took around six months before we got the official papers. Unfortunately the administration process takes too much time and energy here in Mali, but I am glad we finally got green light to start our activities and operate under the legal form of association. What do you think personally, how difficult it is to reach out to young people, academic freshmen? Especially with the given domestic difficulties, what are the most successful methods to let the youth being engaged with your work? In a personal point of view, it is not so difficult to reach out young people. Most of young Malians are open to new initiatives, which make reaching them quite easy. They usually gather in groups whether it is for sport activities or just debating in informal way around a cup of tea. On the other hand, getting the youth to be engaged is the biggest challenge. The lack of confidence and awareness are the main barriers to youth engagement. 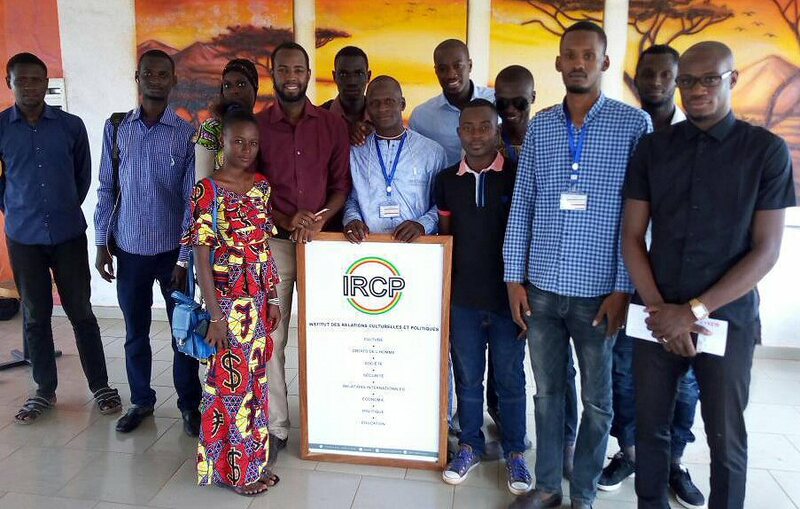 As for the methods to get them more engaged, the IRCP Mali chooses subjects that deal with youth problems and uses several methods, including non-formal activities, such as design-thinking to solve problems. We try to inform the youth about the opportunities they could possibly get and we create an area of sharing, trust and self-confidence. IRCP also gives a voice to the youth in the development of their community and helps young people to develop their abilities. What are the biggest difficulties of running a non-profit organization in Mali? As a novice in the area, running a non-profit organisation is not uncomplicated at all. First of all, old organisations do not have trust in newcomers and they barely have opportunity to demonstrate what they can do. Secondly, I should mention the problem of financial support which causes most of the time the distinction of lot of non-profit organisations in Mali. Without financial support an organisation cannot lead activities and without activities, events, the organisation cannot fulfil its aims. Finally, the lack of assistance and help from funding organisations or sometimes even the administrational blocks makes it hard for a non-profit organisation to survive. In spite of all these difficulties I strongly believe that the Institut des Relations Culturelles et Politiques will flourish and serves as an ever-developing organisation that Mali youth can rely on.